I’m delighted to welcome Ellie Holmes to my little blog today! This is a great post- I definitely need all the cheerleading I can get! We all need a cheerleader in our lives, someone who supports us in whatever we choose to do. A person who is there when the going gets tough with a supportive smile, a reassuring squeeze of the hand or an encouraging nod. A person who will listen calmly as we rant about the injustices that have befallen us or which we imagine might have befallen us. Someone to share the wine (whine?) with. Our cheerleader is a person who has the clarity of vision to look at any given situation and whilst still playing the role of our cheerleader can see where we might have taken a wrong turn and not be afraid to tell us so. Our cheerleader is someone who knows us inside out, our limitations and our strengths. They know what we are capable of without the shadow of self doubt darkening their minds as it so often does our own. That is why they know we can succeed at whatever endeavour we have set our minds on and can calm our fears when we question ourselves. Sometimes they and only they can see our true potential and push us along the road to achieving it. That is when a cheerleader becomes an enabler. How many of us would be where we are today and have achieved the things we have achieved without that inspiring teacher or role model, that parent or other relative who took the time and trouble to build up our self confidence? That someone special who made us believe in ourselves and that anything is possible. Some have always been in our lives, others arrive late and leave early. But if you have experienced the power of having a cheerleader of our own, you never forget it and you are never the same again. If you have someone like that in your life be grateful, recognise their contribution for what it is and, if you can, repay the favour by being there for them too. If it is too late for that, try to pay it forward by being a cheerleader for someone else. There have been countless studies done into the feelings of well being evoked in us when we help others. Those same feelings are not replicated when the only person we are helping is ourselves. So, when the opportunity presents itself and you can help someone else, be their cheerleader, help them as someone once helped you and keep the cycle of goodwill spinning. Having a cheerleader is a wonderful gift. Being one is even better. With her engagement in tatters, Jonquil Jones, a Portable Antiquities specialist, moves to Cornwall for a fresh start. When a report arrives of a treasure trove that has lain hidden underground for centuries, she can feel her soul stirring with excitement. Is it a one off or the beginning of an extraordinary discovery? It’s Jonquil’s job to find out. There is only one problem: the man who reported the find, Sebastian Ableyard, is the man Jonquil holds responsible for the break-up of her engagement. Can Jonquil, with the help of Cornishman, Drew Danvers, uncover the ancient landscape’s secrets in time or will plundering treasure hunters beat them to it? And can Jonquil find a way to set aside her fears and risk her heart again on love? Set against the stunning backdrop of the Cornish countryside and combining heart and soul with a dash of danger, The Tregelian Hoard is the first novella in the exciting new Jonquil Jones Mystery Series by Ellie Holmes. Jonquil parked her red Mini Cooper beside the farm shop. As she thumbed her car alarm a blue Triumph Stag roared up and parked across the yard in a shower of gravel. She watched as the driver leapt from the car and pocketed the keys without locking it. Dressed in jeans and a white short-sleeved shirt, he was tall and slender with dark, curly hair. Catching sight of Jonquil, the man halted. ‘Hello there. Shop’s closed I’m afraid but I can probably get Mum to open up again if I ask her nicely.’ He smiled disarmingly, revealing a pair of cute, deep-set dimples. ‘Drew Danvers?’ Jonquil asked, hazarding a guess. As she came closer and mindful of her aunt’s lively description, Jonquil was left in no doubt. The man’s eyes were the deepest, richest blue Jonquil had ever seen. A Cornish sea on a summer’s day. Jonquil felt her heart flutter in response to the man’s keen gaze and thrust her car key into the pocket of her denim jacket, letting the edge of the key bite into her palm. You don’t need anyone, remember? 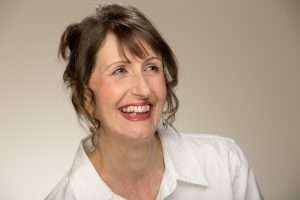 Ellie Holmes writes full length commercial women’s fiction with a touch of romantic suspense and romantic mystery novellas – books that have heart and soul with a dash of danger. Ellie takes her inspiration from the beautiful Essex countryside and the sublime Cornish coast. Romantic and engaging, Ellie’s style of writing will draw you in and keep you turning the pages. Heart-warming stories and compelling characters will stay with you long after you close her books. 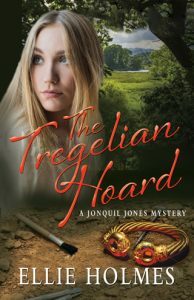 The Tregelian Hoard is the first novella in the Jonquil Jones Mystery Series. Thanks again for such a positive post. I’m very lucky to have a few cheerleaders in my life- I hope you all have them too!